From Bacolod City, the team travelled by bus for about 2 hours in going to Barangay Haguimit, La Carlota City. 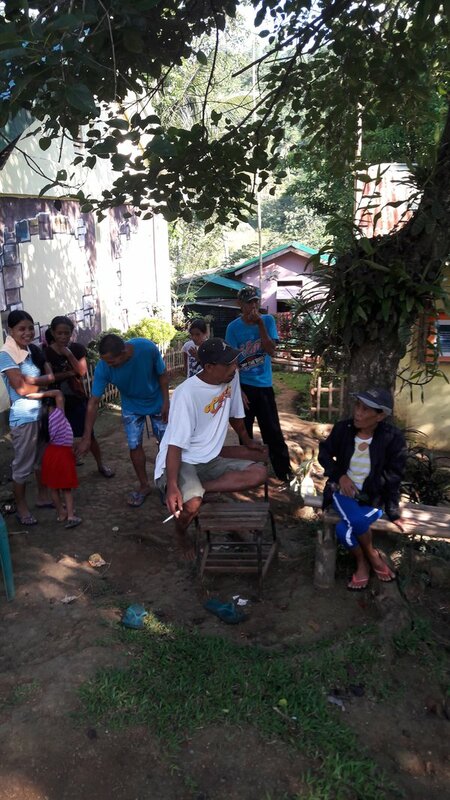 We reached Barangay Haguimit at around 6:00 in the evening and from Barangay proper we took tricycle in going to Sitio Manggapsang as the end point. The team have to trek upstream double time as the sun is about rest and it would be dark soon (It was very fortunate for me that I brought along my flashlight). We reached the house of Alex Bacaoco, the newly elected chairperson of Sitio Tinin-awan, Jamindang Farm Workers and Water Association (STJFWA) 6:41 in the evening. With the our speed in trekking uphill, I could felt my legs ache and my heart beats fast (for almost 4 months, I have not walked and trekked as it was before). Along the way in going to the sitio, I noticed that the path we trekked were almost boulders at the side and I also noticed (though already dim) that the soil could be slippery when wet. It came to my mind how hard for the installation team and the beneficiaries to haul the materials for the project. As we approached the house of Alex, I could hear the voices of his children and the sound of plates. With these sounds, suddenly I felt hungry. We entered the house and prepared our supper (the team brought along fish, canned goods for our meals up to the following day). After supper, Alex gave us mat and pillow. Maybe because of tiredness, the team slept early. 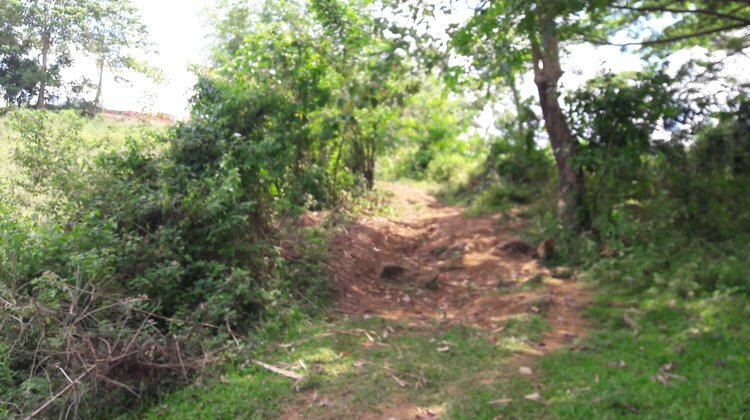 According to the residents, Sitio Jamindang originate its name from a tree called jamindang that grew abundantly in the area. In 1950’s, the first to settle in this sitio was a certain “Lolo Imok”. He brought along with him his family. They first till the land (kaingin) and planted with banana and bamboo. Lolo Imok also tended livestocks (goats and carabao). Manuel Badol, Bosoy Sarasia and Isaac Deonila followed Lolo Imok in 1960’s. The place is a forested area and the early settlers practiced “kaingin” (cut and burn) farming. They planted this with coffee, banana and some fruit bearing trees. As time went on, lowlanders who opted for farming settled the area and some middle rich families bought land and planted it with sugarcane. 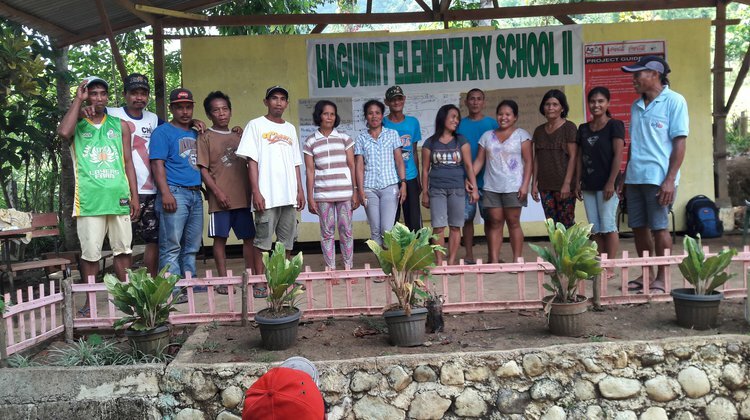 Today Sitio Jamindang has 38 households while Sitio Tinin-awan has 25 households. 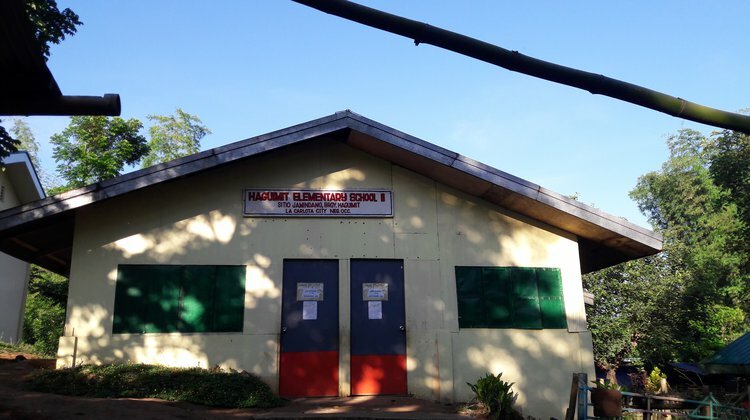 In Sitio Jamindang, has a complete Elementary school is located (Grade 1 to 6). 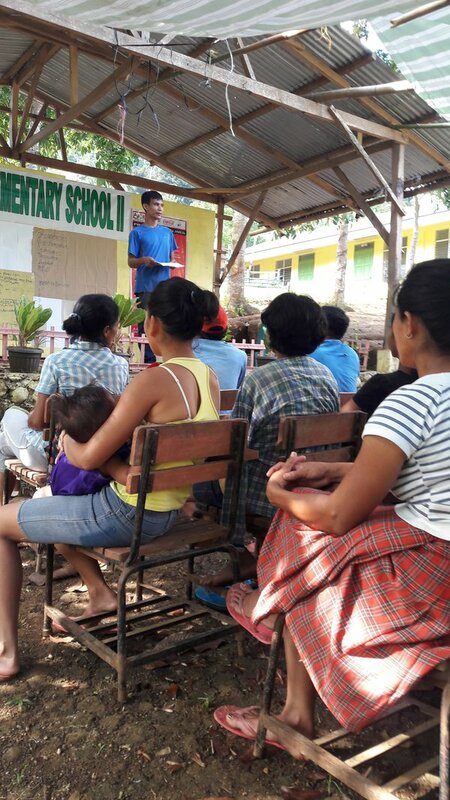 Although the Sitio has a Public Elementary School, there are still many basic social services that this two (2) sitios needed. One of the basic need which is absent in the two sitios is the access to clean and potable water. According to the residents of these two sitios, there are small spring around their place and this is where they fetched water. However, during summer these springs dried up which pushed them to fetched water downstream at a distance of almost a kilometer. Fortunately, Sitio Jamindang and Tinin-awan are beneficiaries of Agos Ram Pump Project. 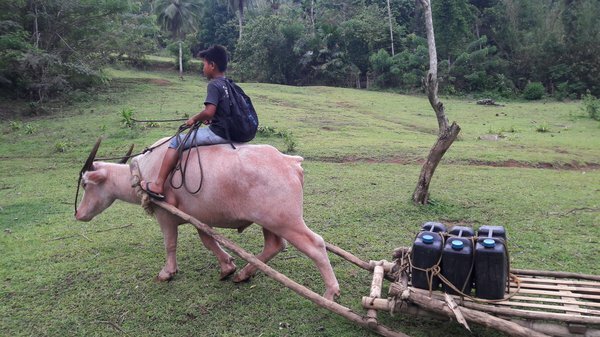 This project is being funded by Coca-Cola Foundation Philippines, Inc. and implemented by Alternative Indigenous Development Foundation, Inc.
We traversed (after the meeting with the association) back, the team happened to pass by a child with an oxcart fetching water. I was told by the child that it is his daily routine. He do this every 2 times a week. This water is only for their drinking usage and for bathing and washing clothes, they do it in the spring source. Sitio Jamindang and Tinin-awan has no access to electricity. The present of solar system in some household is their means of illuminations during night time. In a small group discussion, we were informed by the residents that aside from water, farm to market road is also needed. Farmers has to use “oxcart” or “tuwang-tuwang” (bamboo that being use to carry heavy loads) in transporting their products to Sitio Manggapsang where tricycles are waiting. Being a mountainous area, the two sitios could only be reached through trekking the stony and sometimes slippery (when it rains) path. When we reached and entered the house of Alex Bacaoco, I noticed that there were many ribbons and medals. Out of curiosity, I asked Alex about these. He told me that the medals and ribbons were of his eldest son. I will never forget what he told me, “ang edukasyon kag alam, amo lang ang manggad namon nga ipanubli sa akon mga bata” (the only wealth that I could pass/inherit to my children is education and knowledge). There is no T.V. sets, no gadgets (except for a cellphone and a set of audio system). When I went out of house, I saw the child of Alex playing and I am amazed because children nowadays does not experience this. The residents are so polite and very participative. After sipping our hot coffee, the team hurriedly trek and went to the venue where the meeting should be held. I was informed by Ireneo (CDF) and Allan (Trainer) that the meeting will start at 7:00 in the morning. 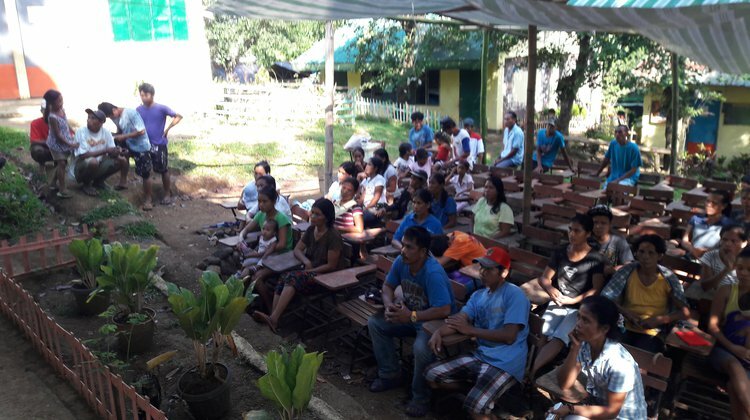 Upon reaching the school, some beneficiaries were already there. So, the team prepared the venue and has to collectively perform tasks. We started our meeting as the participants reached more than 80% attendance. Allan and Ireneo facilitated the meeting while myself acted co-facilitator. We discussed the importance of an organization, the Constitution and By-Laws of the organization, the tasks, functions and responsibilities of the members and the officers. An election of the association officers was also conducted. After the meeting and bidding farewell to the community, we trekked down (except for Ireneo who will be conducting planning session with the EXECOM). It was almost noontime and the sun is blazing its rays at the maximum level. I could feel the heat. I also saw the beauty of the place, the serenity and the view.